The Guild Hall in Preston is snookers home for the next few days as the iconic venue which has seen many a night of high drama on the baize plays host to two qualifying events, firstly the new European Masters which unfortunately follows the best of seven format and more interestingly the International Championship which is played over the much more appealing best of eleven. I won’t be getting involved in the best of sevens from a betting perspective and instead will spend the next three days taking a good look at the best of eleven match ups and hopefully coming up with a few winners. All you need to know is below. Semi-finals and Final weekend in Shanghai after a thoroughly entertaining week in China in what has felt like a really established tournament in the annual calendar, helped I think by the fact there were fewer players at the main venue at the start. It’s the top two ranked players in the world and the last two world champions in the opening semi-final with China’s finest Ding against Scotland’s Mags in the second. Maguire who made a maximum earlier in the week is making a much needed surge back towards the top 16, which I know a lot of people think is where he belongs for a few more years yet. I think we’ll see Selby in the final but the other one for me is a coin toss, gun to head I’d probably go for Ding but I’d not be surprised either way and think it could go all the way personally. Recommended Bet: Double pays over 9/4 at Corals on Selby to beat Bingham and Ding v Mags over 9.5 frames. It’s Quarter Final Friday in Shanghai as the last eight players left are whittled down to four. It’s still all to play for and it’s far from easy to pick a winner with World Champion Mark Selby now the bookies favourite following defeats for Ronnie O’Sullivan, Neil Robertson and Judd Trump. But the field is still very strong with only two players that haven’t got a main ranking event to their name so it’s far from done and dusted and looks like being a cracking final weekend. Predicted Winners: Carter, Selby, Holt and Maguire. Recommended Bet: Treble on Carter, Holt and Maguire pays just over 9/1. Thursday in Shanghai is the day that we whittle down the field from sixteen to the final eight and as you’d expect given the format of this event it has thrown up several mouth-watering ties. Wednesday saw a couple of what could legitimately be referred to as shock scorelines with Ryan Day beating Neil Robertson, Mei Xi Wen beating Mark Williams and Stuart Carrington edging out Joe Perry in a decider. Stephen Maguire whitewashed Shaun Murphy but ‘shrewdies’ out there would not have regarded that as a major shock given Shaun’s recent personal goings-on. 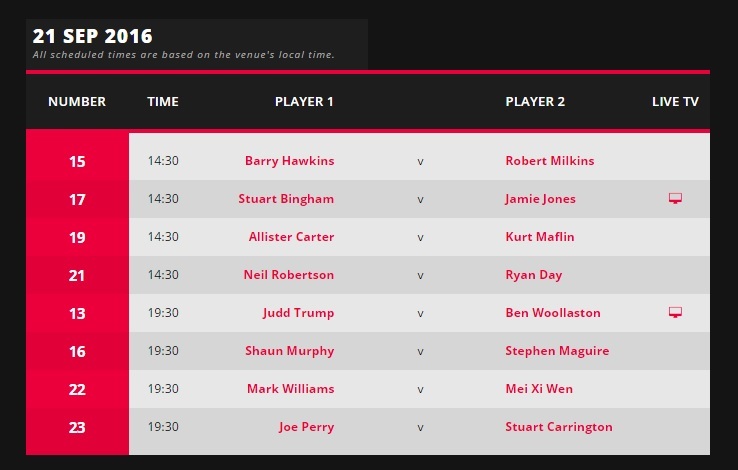 While there are some good ties in the opening session it could be argued that they might have swapped a couple with the second session as I think most fans would want to see all of the matches then. 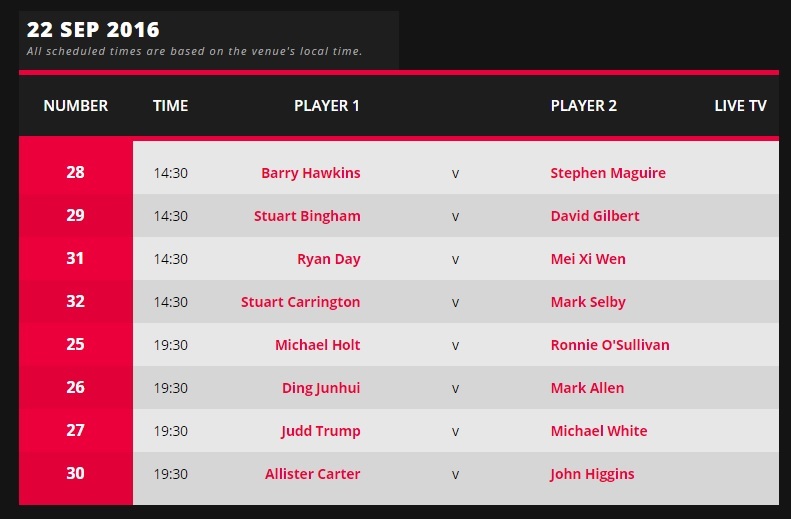 No doubt that the matches involving Ding and Ronnie will get the nod for TV tables and you know there must be some decent stuff going on when the likes of Trump, White, Carter and Higgins aren’t on a main arena table. Anyway, it’s been entertaining enough so far and the 32 at the venue for me is still the best format there is and allows the event to flow without ever feeling too rushed. Big crowds so far over in Shanghai in what I think most of the players class as their favourite venue and event in China. We’ve already seen last year’s champion Kyren Wilson beaten as well as a 147 from Stephen Maguire, so it’s been an eventful start to the tournament. Wednesday sees the last lot of the last 32 matches being played out with the Shaun Murphy/Stephen Maguire tie probably the pick of the bunch. In case anyone missed it there was also some big news in the snooker world announced earlier this week when it was confirmed that a new financially lucrative China Championship will be played in November in the city of Guangzhou in the Guangdong Province of South East China. It will be a 16 player event made up of the top ten on the main ranking list and the top 4 from the one year ranking list alongside 2 players nominated by the Chinese Snooker governing body. Following this and for the next three years it will be a 128 player full ranking event. The first prize is topped only by the World Championship with the winner set to carry off a no doubt oversized cheque for £250,000. So it’s great news for the players at the top of the sport who continue to grow richer and richer. RECOMMENDED WEDNESDAY BET: Treble on Bingham (-1.5), Maflin (+2.5) and Williams (-2.5) pays over 9/2 at Marathon Bet. Stephen Maguire to beat Shaun Murphy at 11/8. 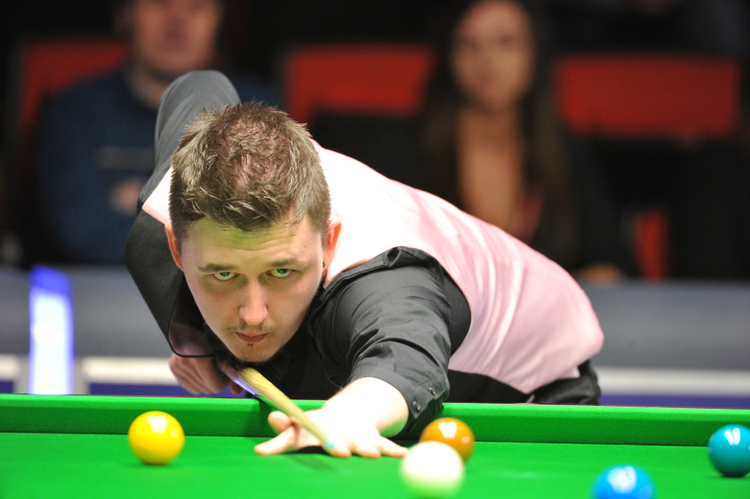 To me it seems like longer than a year ago that Kyren Wilson’s meteoric rise up the rankings started here in Shanghai when he came all the way from the first day of qualifiers to lift the trophy and begin what was to be an incredible emergence and eventual breakthrough into the world’s top 16. I can’t think of a player in recent memory whose earning potential and ranking has changed as quickly as the defending champion’s here has. Shanghai used to symbolize the start of the season proper but of course these days we have a few events going on when it’s sunny. I have to say that I have struggled to get into the tournaments so far this season and haven’t really watched any of them with any great enthusiasm. I’m obviously delighted that Ali Carter has risen so quickly up the rankings and back into the top 16 by virtue of his World Open triumph but aside from that I still remain in the camp that would like to see a closed season in summer before it all ramps up again from around this time of year. Unfortunately, Shanghai in common with all the other Chinese ranking events continues to shoo-in wildcards after the qualifiers. This time there are 8 players competing from the start who have no right to be there. Hopefully they will all lose and we’ll say no more about it but history dictates that at least one of them will win and leave the player who has worked hard to qualify wondering why they are taking the early flight home before the tournament has even started. No doubt another reason that this event will get the interest of a wider public is the fact that Ronnie O’Sullivan makes his seasonal debut. It’s a long time since Ronnie has played competitively in China and he will face either Liang Wenbo or wildcard and Santa Claus impersonator Hu Hao in the first round, setting up a possible meeting with Kyren Wilson in Round 2. Indeed the top quarter is something of a *cliche claxon* ‘quarter of death’ with 6 Reds Champ Ding Junhui, recent Indian Champ Anthony McGill, the in-form Michael Holt and Mark Allen all in the mix. The second quarter sees Judd Trump and Shaun Murphy seeded to meet in the quarter finals. I’m not sure how much preparation Shaun will have been able to put in seeing as he’s just become a dad for the first time, early days of fatherhood with all its sick, snot, nappies and stuff doesn’t tend to mix too well with snooker and it wouldn’t be a surprise to see him not quite at his sharpest for a few months yet. Judd is fresh from his Eleven-30 series of exhibitions with Ronnie so has been keeping his eye in. Also in this half we have Stephen Maguire, who being outside the top 16 these days is scheduled to play an as yet unnamed wildcard before facing Murphy in round one, let’s hope he remembers his chalk. Also in the mix are Ricky Walden who is still searching for a nickname, Michael White, Barry Hawkins, Rob Milkins and Ben Woollaston. I think I’d personally take a punt on Judd to come through this quarter. Down in quarter three we have former world champions Stuart Bingham and John Higgins seeded to meet in the last eight. But again there are plenty of hurdles for them to jump to make that. 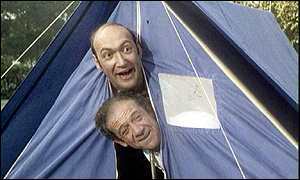 If Higgins manages to tackle Matt ‘Marmite’ Selt in Round 1 he will most likely face Ali Carter in the second round. These two don’t half seem to play each other a lot, it’s almost like their names are glued together in the draw hat sometimes (yes I know there isn’t a draw hat). But with the likes of Marco Fu, Dave Gilbert, Jamie Jones and Kurt Maflin all in here again it’s a tough section to call. Finally in the bottom quarter we have two real heavyweights of the sport (not literally as I’ve seen more fat on a butchers pencil) in Neil Roberston and World Champion Mark Selby seeded to meet in the quarter finals. Despite the presence of Mark ‘semi-retired’ Williams, Joe Perry, Martin Gould, Ryan Day and Stuart Carrington, you’d have to say that it would be something of a shock if Robbo and The Jester didn’t square up for a battle at the business end and as ever when the two of them play it will be very much who is better on the day as you can’t really split them when they are both at their brilliant best. The rumour is that this one will be aired on Eurosport TV, which will make a nice change. There seems to be a bit of confusion lately as to what this big deal Bazza was banging on about at The Crucible actually entails, I wasn’t one of them but there were some people moaning that the recent 6 Reds wasn’t on ES Player when it was advertised as such. The times these are played anyway are not that ideal for a European audience and as ever with the way the Chinese choose to format these we only see a fraction of the matches anyway with usually only one table being covered on the telly. But we’ll enjoy it nonetheless, at least it’s best of nines, and I’m sure they will make sure that we get to see all Ronnie’s matches for as long as he decides to stick around. I wonder whether there has been any deal done on appearance money for him as it is a little out of character for him to play in this, perhaps he has a lucrative exhibition lined up afterwards or something, I don’t know. Anyway Click here for the draw and Click here for the format. Recommended Bets: Judd Trump to win Shanghai Masters at 8/1, Mark Selby to win Shanghai Masters at 7/1, John Higgins to win Shanghai Masters at 18/1. Match Betting to follow. It’s the final day of action in Barnsley before another mini-break in the snooker calendar, if you, like me, don’t count the 6 Reds as proper snooker (I am such a traditionalist I know wanting proper rules). The seeded players 17-32 are here today to take on those who have emerged from the wreckage of the week, it will be interesting to see who is sharpest as those with two or three matches under their belts may just have the momentum to cause an upset or two. Recommended Bets: Doubles, Trebles and an Acca on Jack Lisowski 6/5, Kurt Maflin 5/4, Jamie Jones 5/4 and Nigel Bond 7/4 – acca pays 29/1 at Corals. Today sees the 32 winners from yesterday’s matches face up to each other in the penultimate qualifying round and the winners will face those seeded 17-32 tomorrow. It’s all to play for in Barnsley. Like I mentioned yesterday, I much prefer this format to the flatter one, it’s also nice to at last get back to the best of nine frame matches, there’s nobody on the planet that can convince me that the best of seven conveyor belt format is better than these, it’s one of the poorer changes that has come about in the Bazza Revolution in my humble but correct opinion. 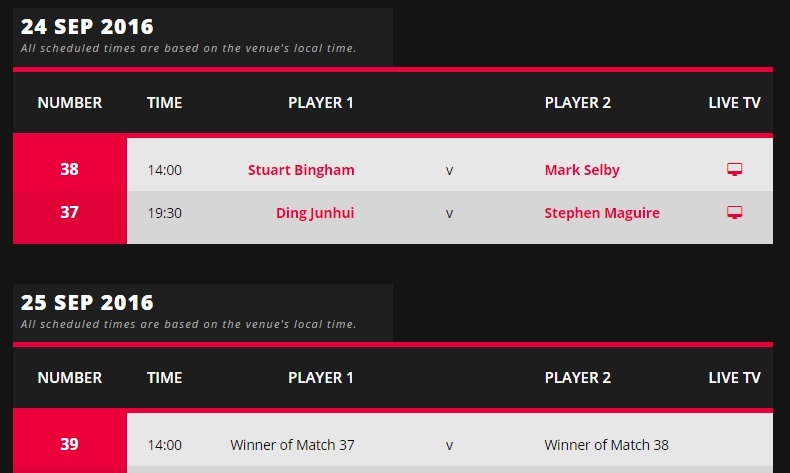 So the winners today go forward to play the likes of Martin Gould, Stephen Maguire, Graeme Dott, Anthony McGill, Michael Holt and Liang Wenbo tomorrow to book a seat on the plane to Shanghai. It’s great to see my mate Martin O’Donnell keeping up his form and he faces Matthew Stevens tonight. Recommended Bets: Treble on Daniel Wells, Jimmy Robertson and Kurt Maflin pays 9/2. Doubles and a Treble on Fergal O’Brien, Ian Preece and Martin O’Donnell – treble pays 20/1. All at Marathonbet.